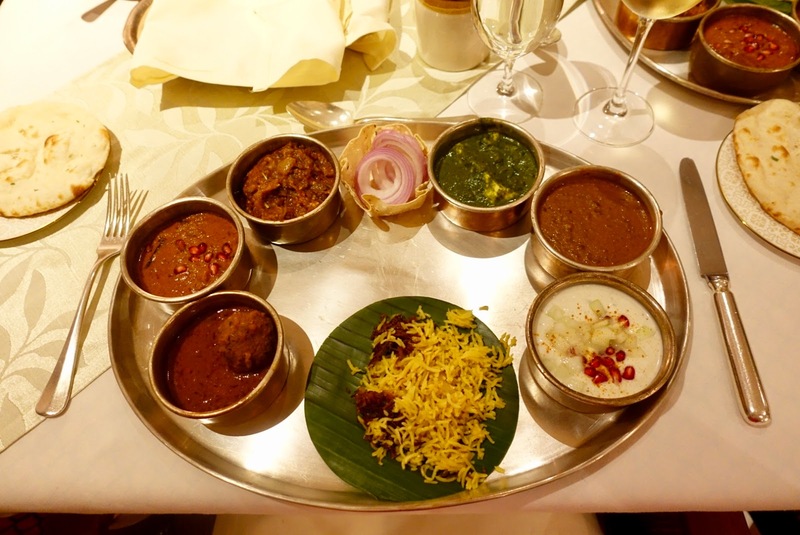 consider the aspect of appropriate lodging and dining in India all the more important in India given the living conditions in this amazing yet multi-facetted country. When I traveled India for the first time more than two decades ago – my husband and I chose it as honeymoon destination – I was often overwhelmed by all the impressions gained during the day. The sensory overload you are likely to be exposed here is no easy thing to bear although there are more than good chances that you will have really memorable experiences. In light of this situation, a retreat into the sanctuary of a comfortable hotel was a necessity at the time. 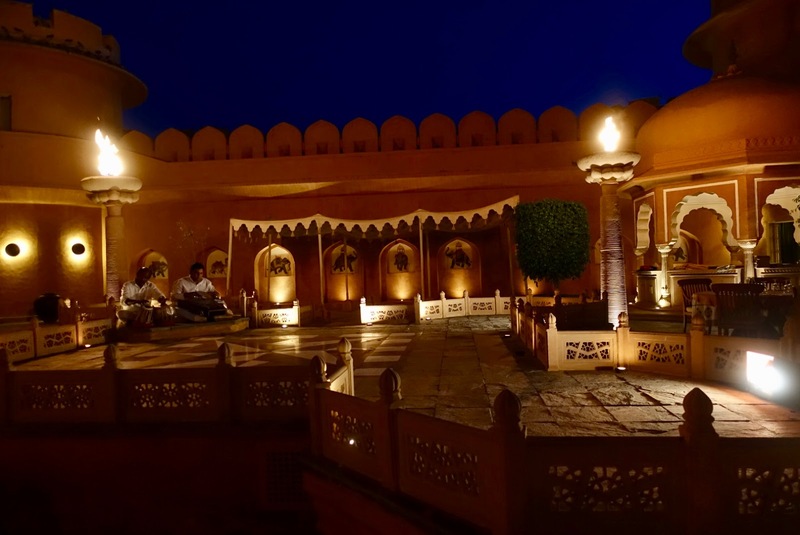 Now, not that young any more, we thought that such resting phases are even more required and therefore opted not only for a sensibly paced itinerary but also for top hotels offering a safe haven after a partly long and arduous journey across Rajasthan. We started our trip in Delhi and ended it in Mumbai. There will be a separate blogpost of these two cities later on, now I will only go into the hotels being part of our tour in Rajasthan. Whereas we also dined outside of our hotels in these two metropolises, we decided not to do this when being on route in the land of the maharajas. There are three reasons for this course of action. 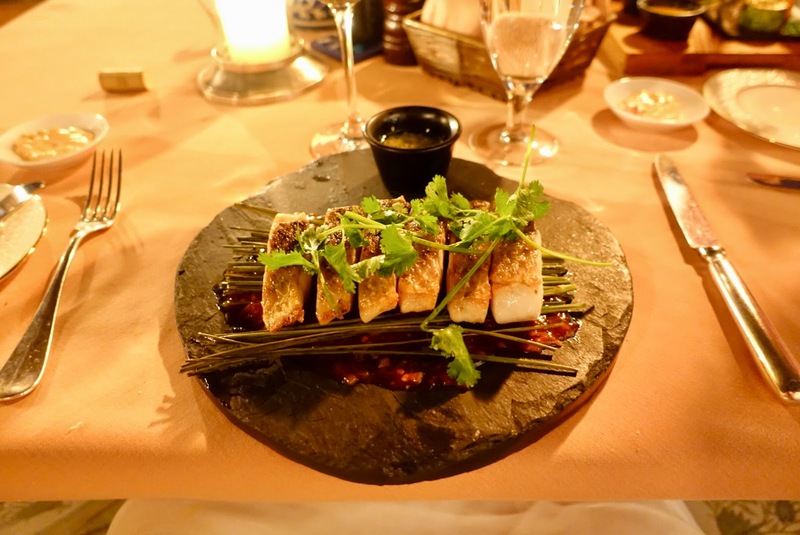 First, you can assume that the quality of restaurants in high-end hotels is normally quite high. Second, alternatives I found are mostly located in other similar hotels. Third, as you certainly are aware of, you have to be concerned about food safety in India. Consequently, we did not venture out to explore the restaurant scene outside of hotels as we usually do on vacation. 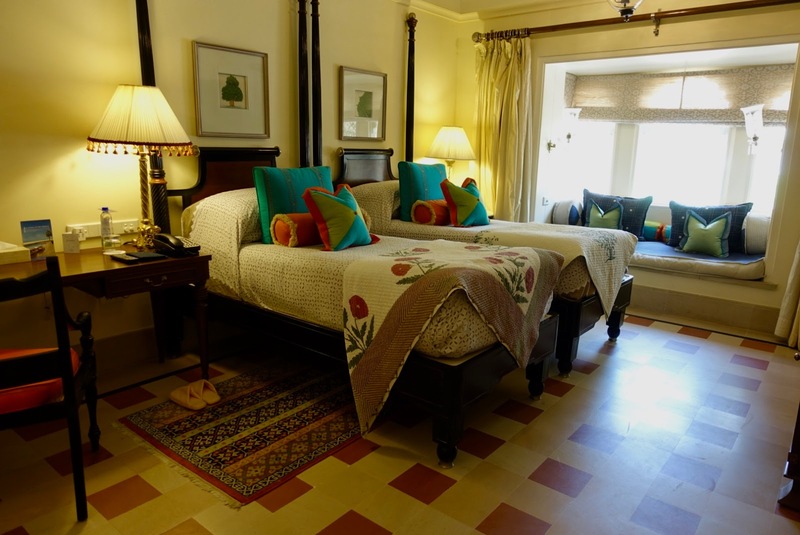 While be booked our hotels in Delhi and Mumbai ourselves, we did not this for the accommodation of our road trip in Rajasthan as it was part of our booking arrangements as outlined in my last blogpost. As mentioned there, we stayed at luxury hotels only with one exception (non-touristy Shahpura), and this on a bed and breakfast basis. 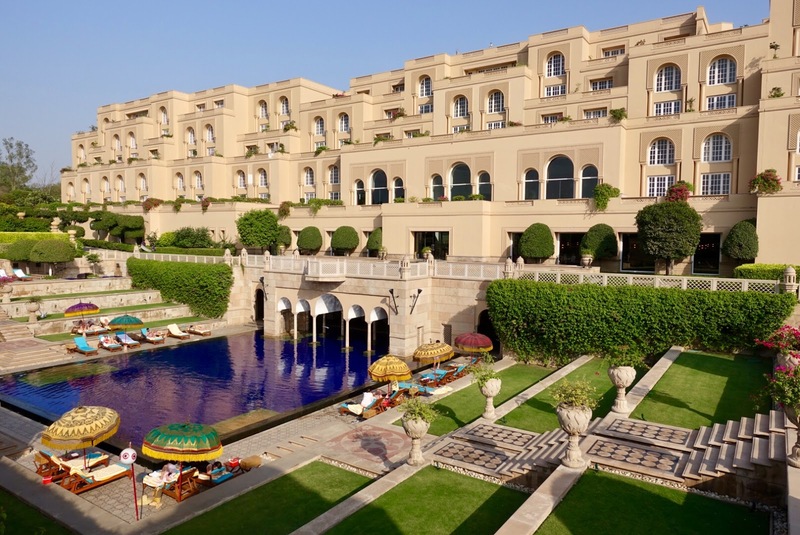 As far as hotel brands are concerned, we had six nights at Oberoi hotels, two at a Taj hotel and one – the above-mentioned exception – at a place not being part of a hotel chain. Everywhere we stayed two nights except in Shaphura where we had only one night. As to the room category in the chain hotels, we were booked in the lowest one as this is common when booking via a travel agency without requesting differently, which we did not. 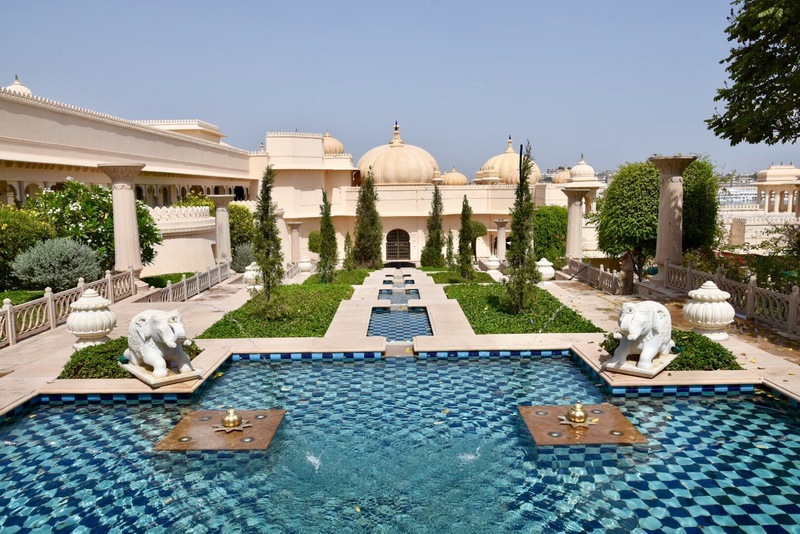 Generally, it could be said about all the hotels of our Rajasthan trip, from which you will find individual reviews in the following, that the level of service was consistently good to very good. 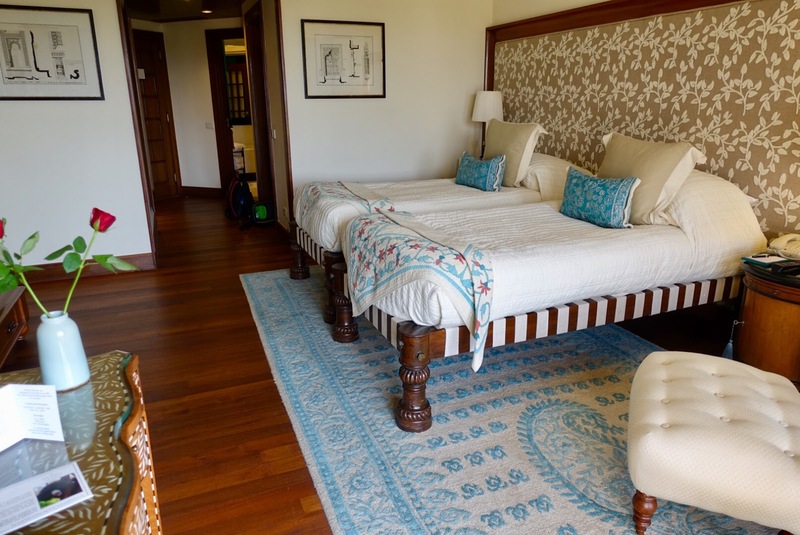 It is apparent that the Oberoi & Taj group put a heavy focus on this aspect. 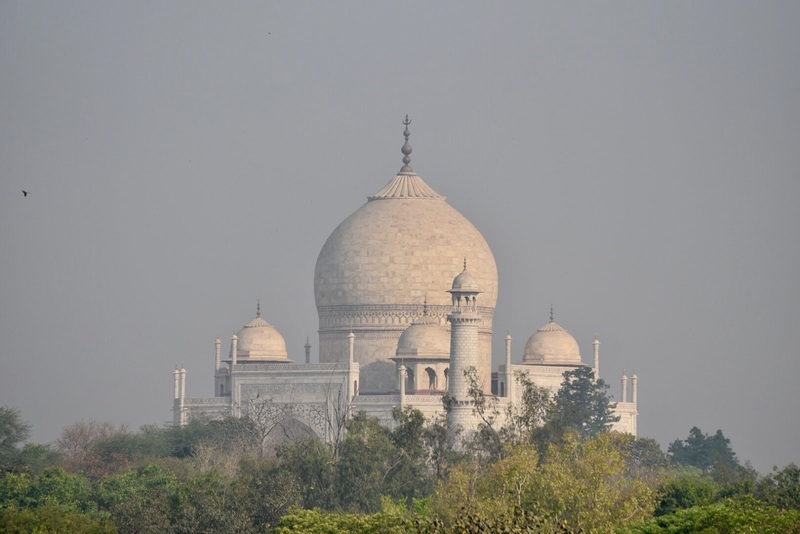 The biggest asset of this property is by any means its location just 600 metres (650 yards) from the iconic Taj Mahal and the fact that all the rooms offer uninterrupted views of this monument. But do let yourself to be fooled, it is not really close (picture taken using a telephoto lens). Nonetheless, it is a great thing to soak up the magical view whenever you want. which is very nice to look at. 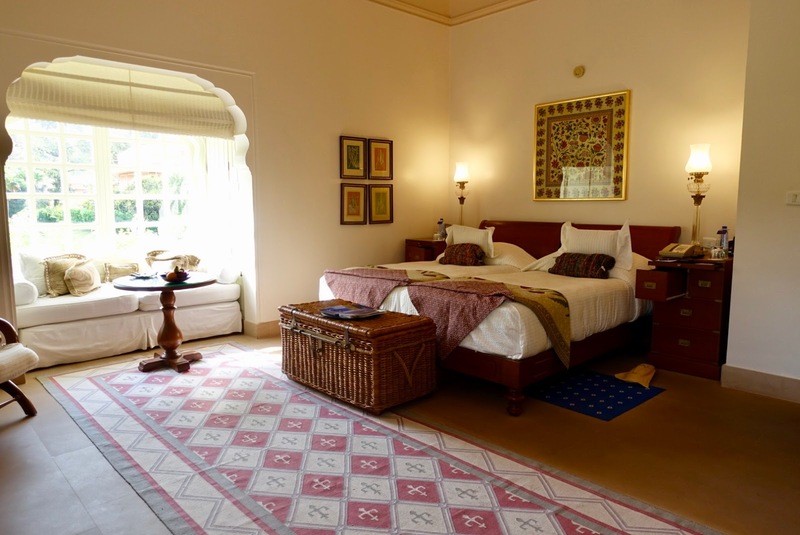 Also our room featured Mughal design as well as other India-specific details (beds, rugs). 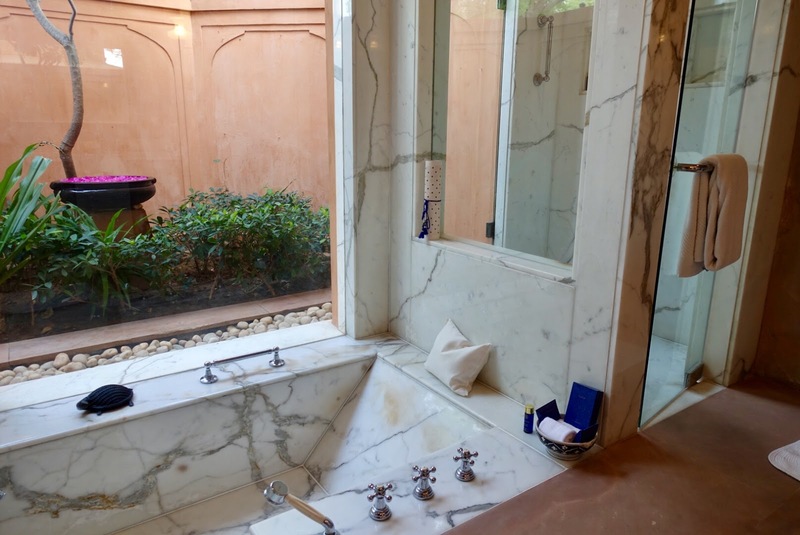 The bathroom was quite classy with some marble and granite. It had a bathtub and a separate shower but was a bit cramped. Negative as far as room was concerned, was the fact that you could not open the window (for taking pictures of the Taj Mahal) and that the room showed some signs of an older propriety. 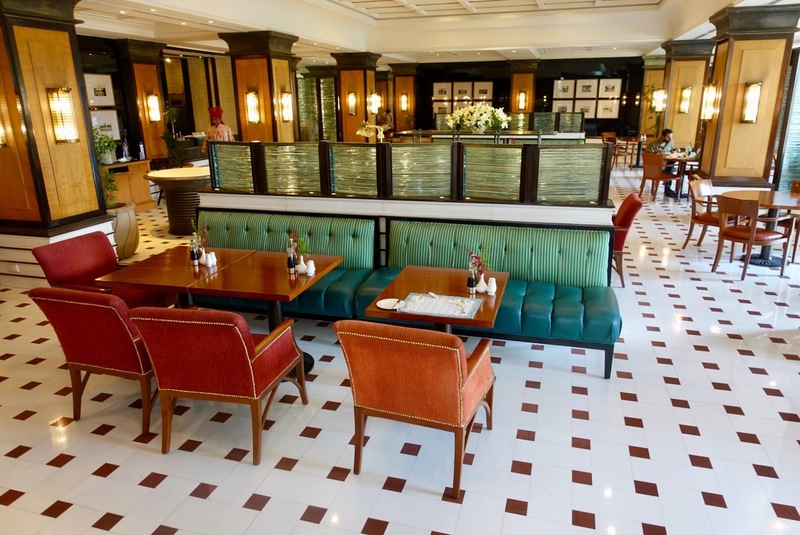 When it comes to restaurants, we enjoyed our breakfasts at the Bellevue (good buffet selection) but decided not to have dinner here because it had the feel of a workplace canteen, although a rather stylish one. 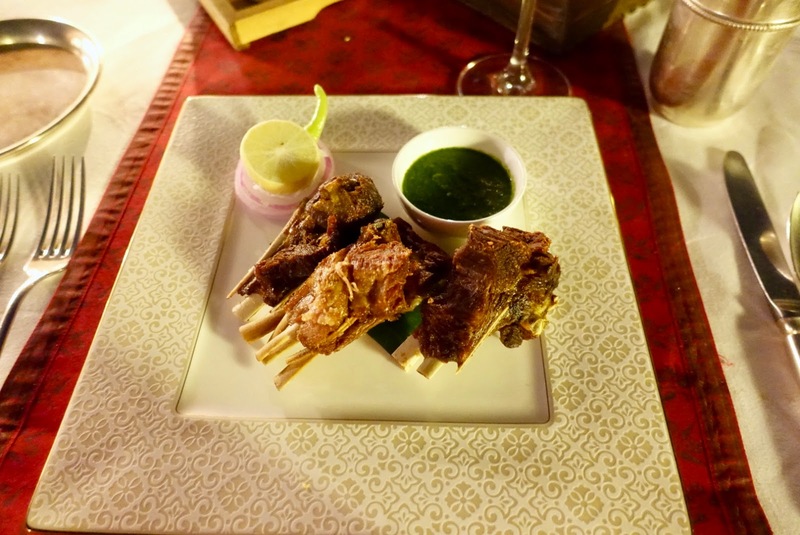 We dined twice at the Esphahan, the Indian specialty restaurant, instead, which clearly was intended as a more upmarket dining experience. While we liked the pleasant atmosphere, we found the food so so. Some dishes were quite good, but others were bland and not very inspired. It was also inconvenient that you had to book for specific sittings. 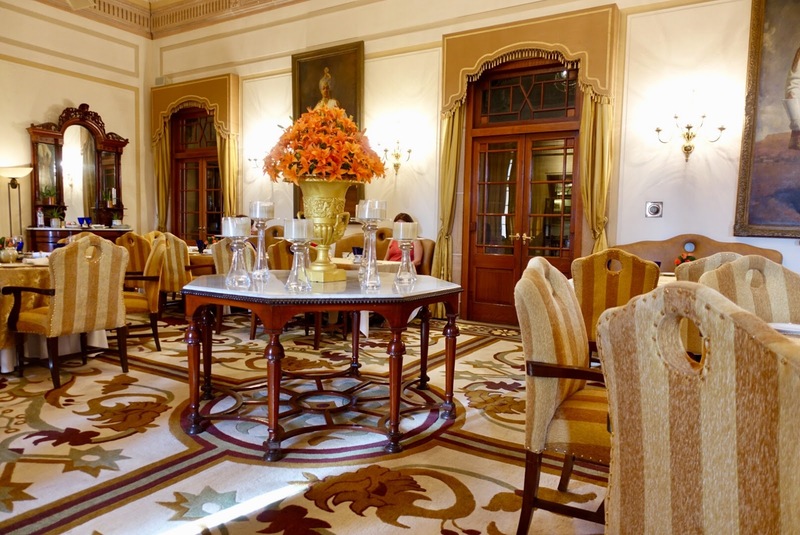 All in all, The Oberoi Amarvilas is by no doubt the best place in town and offers a location that is hard to beat. However, the hotel room was just decent (needs remodeling in the near future) and the evening meals were not persuasive enough. 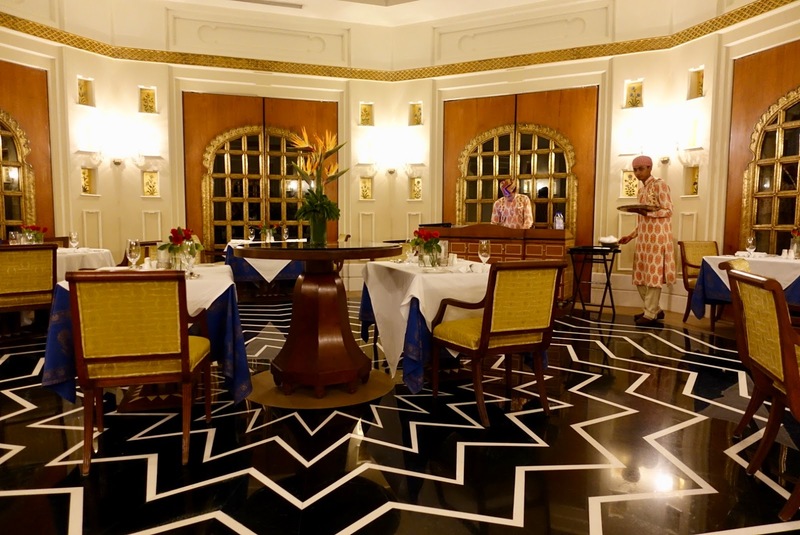 I want to start by saying that this Oberoi hotel was the best of this brand’s three properties we stayed at on our Rajasthan trip, be it in terms of service level, room standard and condition as well as restaurant quality. In terms of service, every employee was polite, smiling and caring. When we met one on a buggy, he or she left it, greeted us und let us pass. The manager was an exemplary host, he was visible morning to night and engaging to all the guests, and above all he was so charming and amiable. The hotel was built to resemble an Indian fort, and this on extensive grounds (13 hectares/32 acres) around a 18thcentury Shiva temple. The gardens are beautifully landscaped with peacocks roaming the property and lots of different birds. It is a real oasis. The bungalow buildings where many rooms are located, look similar to the well-known pink houses in Jaipur’s old town, besides they show many Mughal characteristics. They are laid out in clusters with a courtyard in the middle. Our room was spacious, with a seating area where you can look out across the grounds. It was nicely decorated with natural materials in neutral colors. 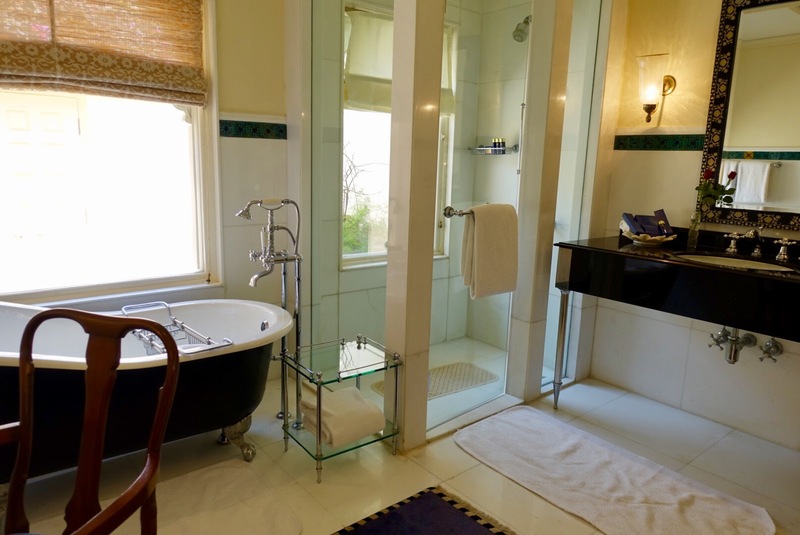 The large bathroom had double sinks, a sunken bathtub as well as a separate shower with views of a private walled garden. We felt very comfortable in here. in the international restaurant Surya Mahal where we were seated in the picturesque courtyard. 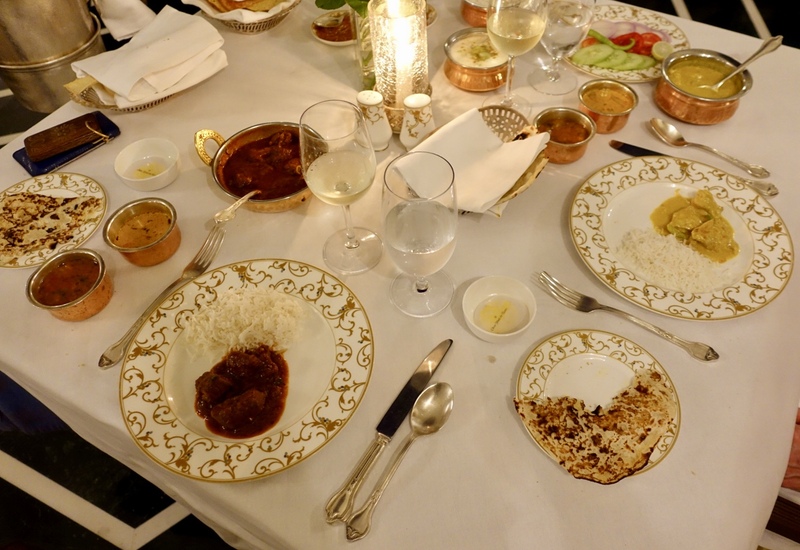 The other time we had a delicious Indian dinner at the Raj Mahal, which serves local food, sometimes also unusual dishes from everywhere in India. The al fresco setting of this dining-spot is also magnificent. 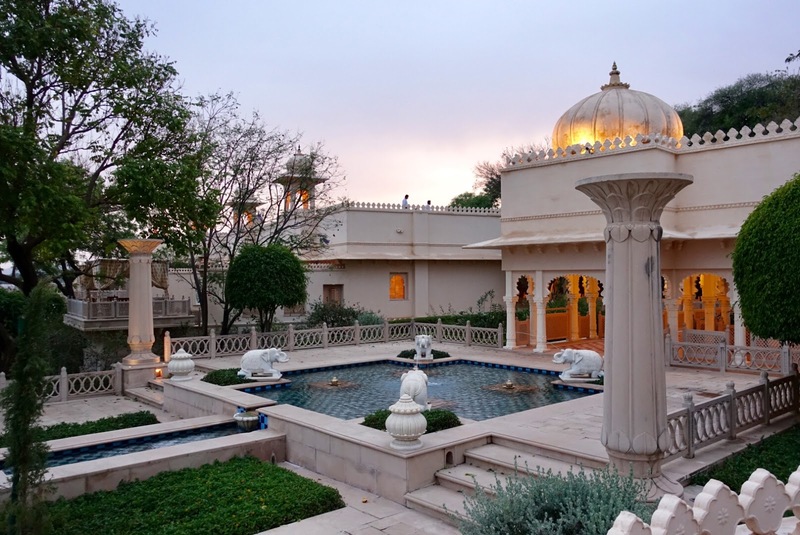 On balance, our stay here at the Oberoi Rajvilas was one of the two highlights of our Rajasthan tour in terms of lodging and dining. 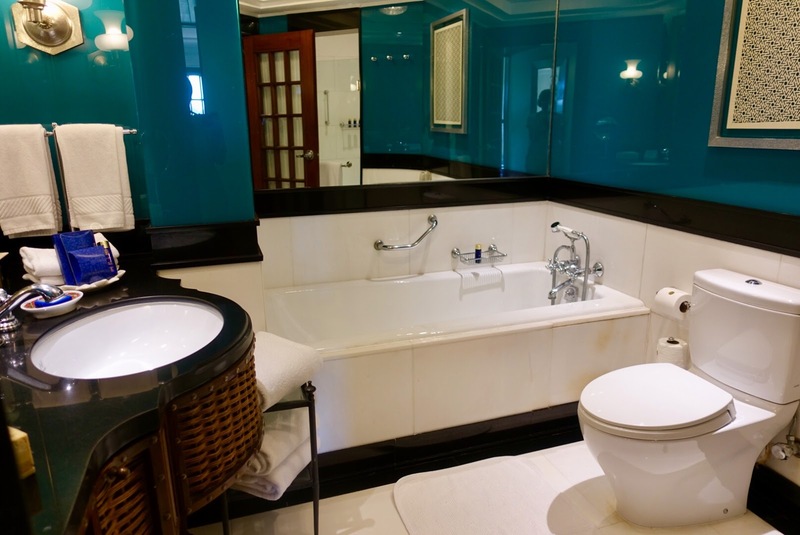 We were very impressed by the hotel’s performance in all important areas. The one thing that was a bit annoying, a tour group, was perfectly handled by the staff in order to not let it impact too much on other guests, my congrats! and visiting the colorful village of Shahpura just outside the hotel’s gate. It was so interesting to walk in one of the mains streets and to get a glimpse of local life. Another good thing to do is take a trip to the family owned Dhikhola Fort for having a look at it and enjoying a sundowner at the top of the building. 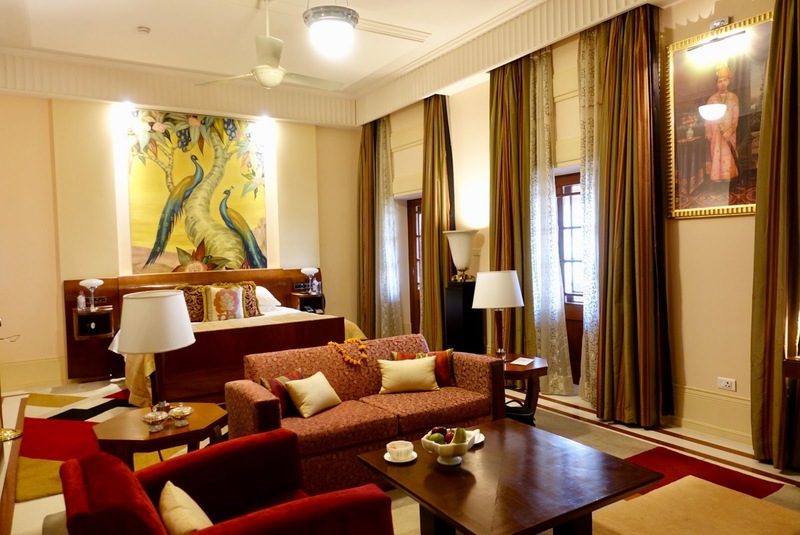 For our one night stay we resided in a Royal Suite, the best room category. 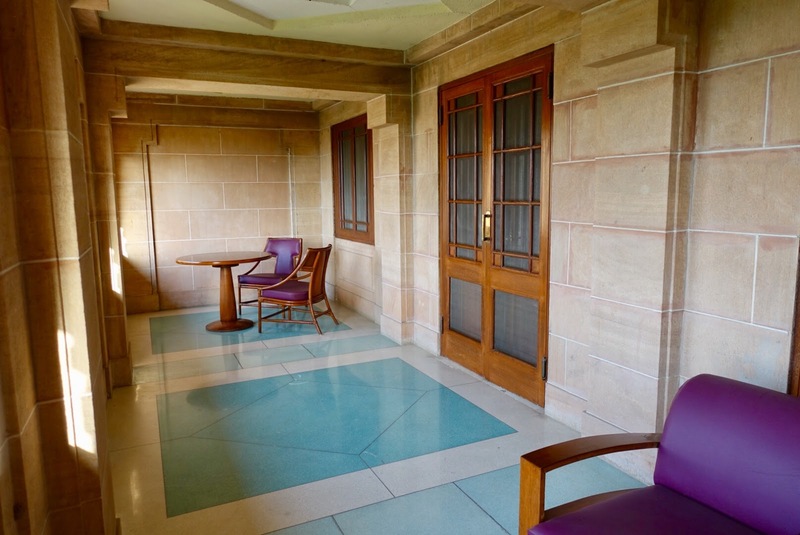 It was located in the main building where visiting British regents were put up in colonial times. 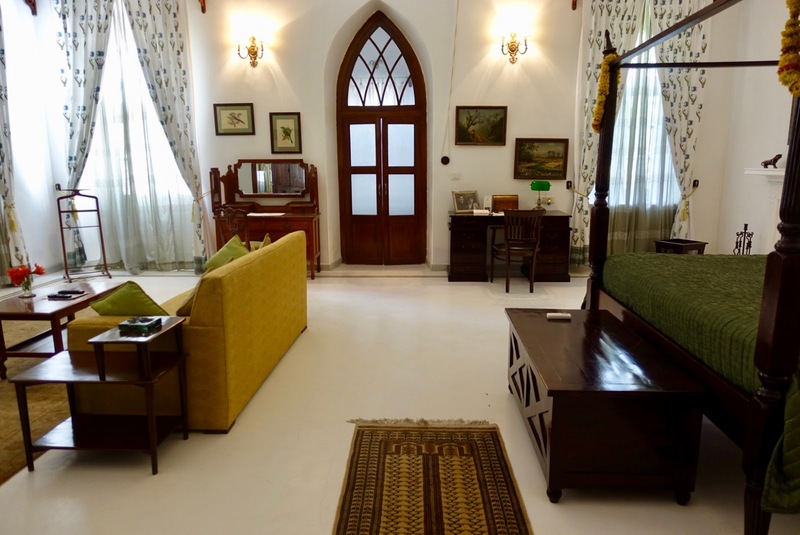 It was expansive, with high ceilings and decorated in a colonial style. The bathroom was large and well-appointed. The only thing that was a bit annoying was the air-condition that only cooled down a part of the suite. As to our meals, we enjoyed a delightful breakfast outdoor in the garden. 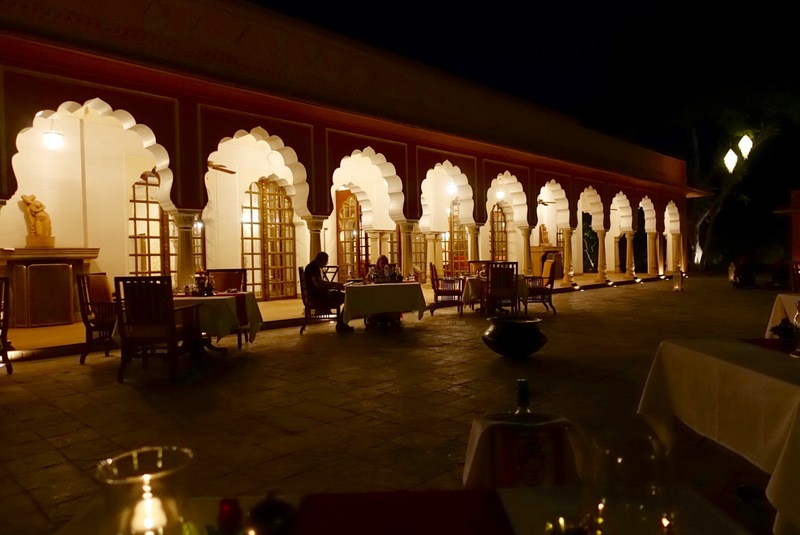 The Indian dinner (set meal) took place here too and was decent albeit not one of the best of our Rajasthan trip. Food was served by local staff, which were friendly although not as trained as in your typical luxury hotel. On the whole, we had a good time at this rural retreat. It was a stunning place to unwind from touring in busy cities and made a pleasant change from the chain hotels we otherwise stayed at. Shahpura was an interesting place to visit as is a real working town and not a tourist spot as all the other destinations of our tour. 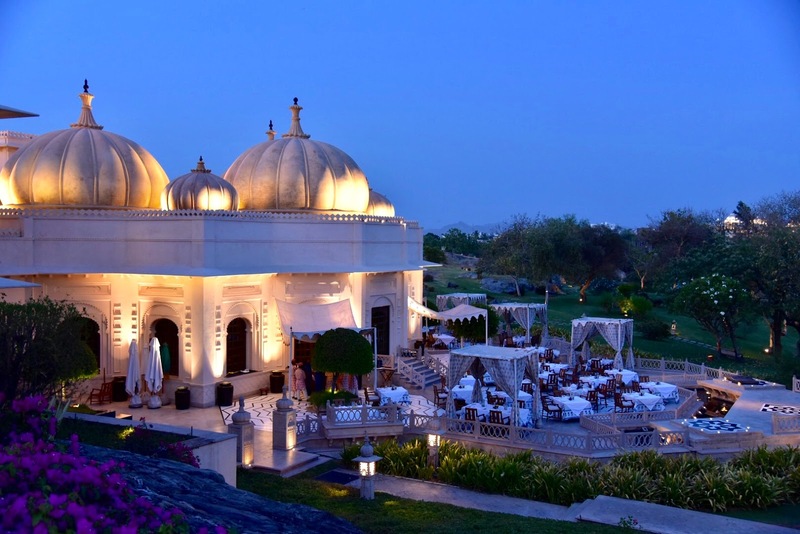 In the so-called most romantic city of India, Udaipur, we had a correspondent hotel too and the last of the three Oberoi properties of our trip. 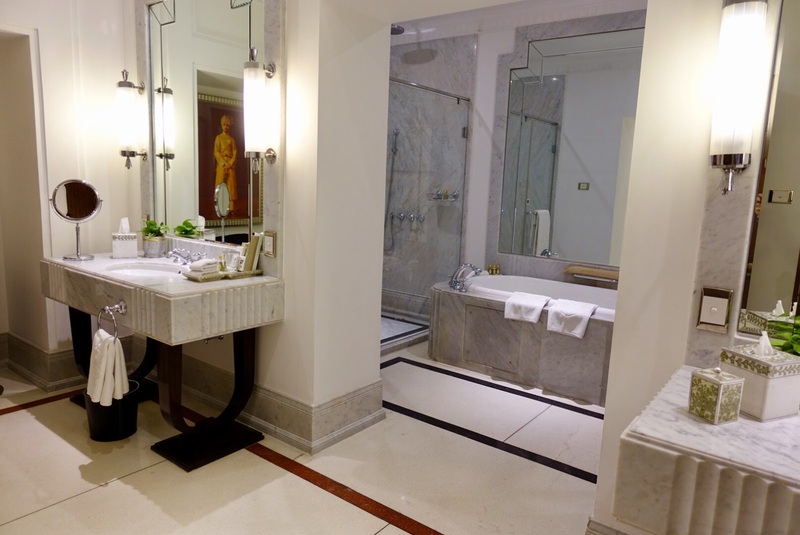 This being already the third one of this chain hotel, we were accustomated to the typical “Oberoi circumstances and procedures” as they were not that different from one hotel to the other one. and judged the cuisine as rather mediocre. 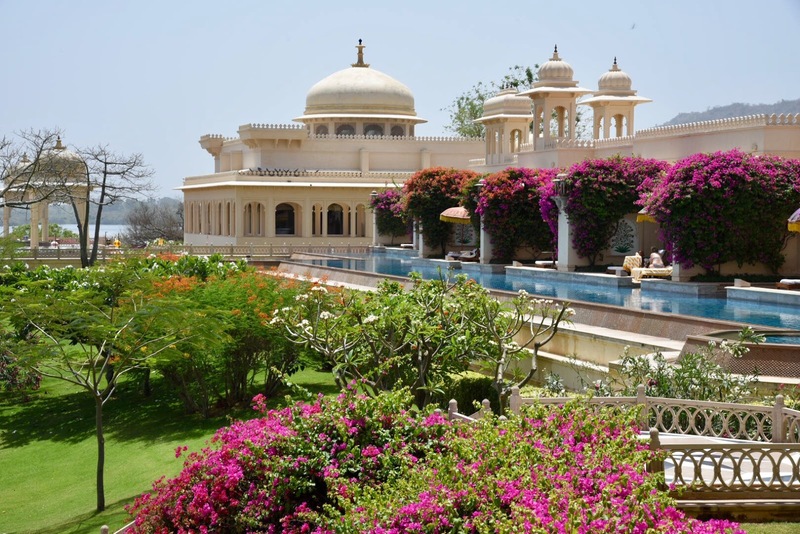 When it comes to the staff, the service level is generally high as this was the case for all Oberoi properties of our Rajasthan trip. Having said this, we had one or two issues that did not fit the picture. First, as our room was not ready upon our arrival (we were early), we decided to have a light lunch in the meantime. To our astonishment, an employee of the reception desk accompanied us and stayed with us – he was talking while we were eating – until our room was ready. Another thing that puzzled me was the fact that there was an attendant present by the pool, but he did not offer to cover the sunbed with a towel but watched me doing this myself. Other guests arriving after me faced the same situation but decided to use the sunbeds as they were. 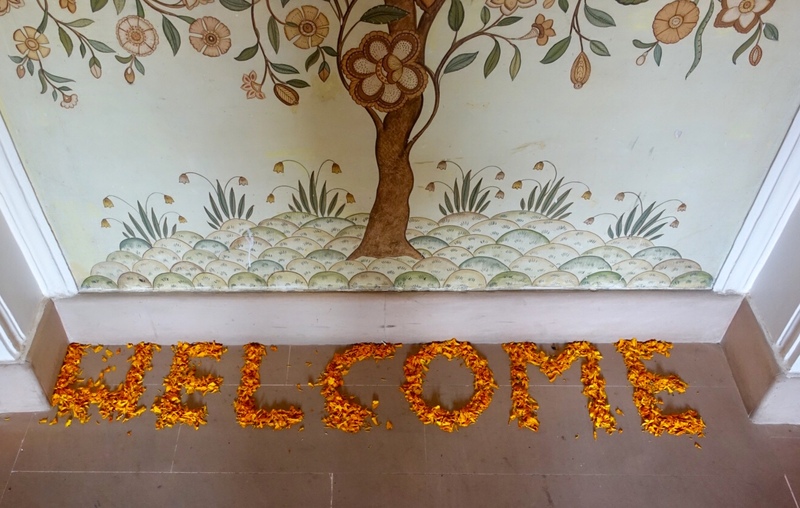 The best thing about the Oberoi Udaivilas is certainly the property itself, which spreads over 20 hectares (50 acres) including a wildlife sanctuary with deer and wild boar. The building complex consists of interconnected domes and walkways as well as of a variety of canals and pools, which is a feast for the eyes. 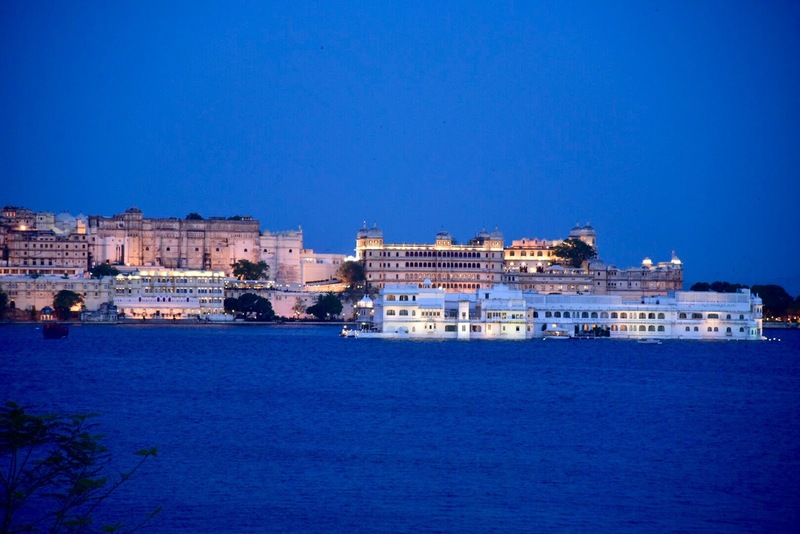 In addition, you always have splendid views of the gardens and/or the Lake Pichola with the other famous landmarks – the Lake Palace Hotel and the City Palace. Speaking of latter, this monument was clearly the model for the construction of the hotel. 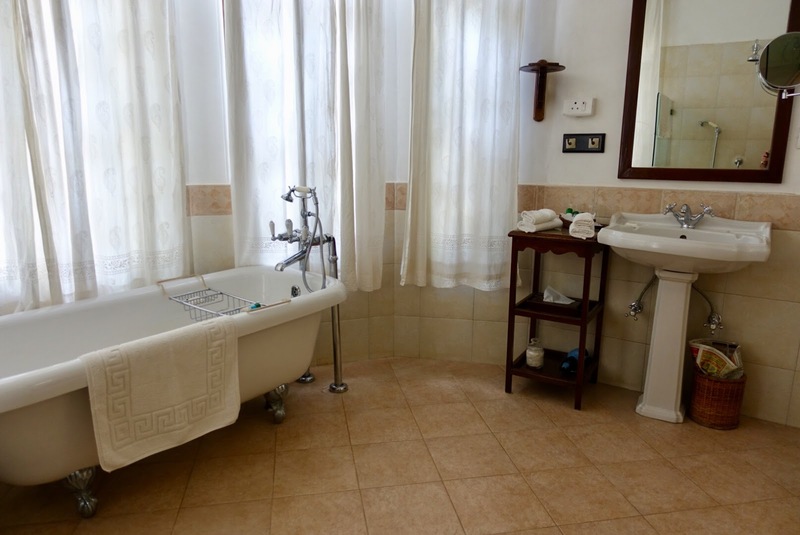 the large bathroom was bright with view to a private courtyard, a free-standing bathtub and a separate shower. While we liked the accommodation, we had an issue with the air-condition – at the foot of the beds and directed to them –, but the staff managed to fix it after the first night. In sum, this is a fantastic property with generously laid out rooms, wonderful gardens and views. As to dining, it has to be said that only the Indian restaurant offered a good enough performance. Also the service was not faultless. Nonetheless, I would return I was delighted by the beauty of the hotel complex. where tourists come to view it although they may only visit the small hotel museum and the vintage car collection unless they are willing to pay the somewhat prohibitive cover charge to have a drink in the Trophy Bar and to catch a glimpse of the unbelievably beautiful central dome, which is the second largest in India after the one at Taj Mahal. 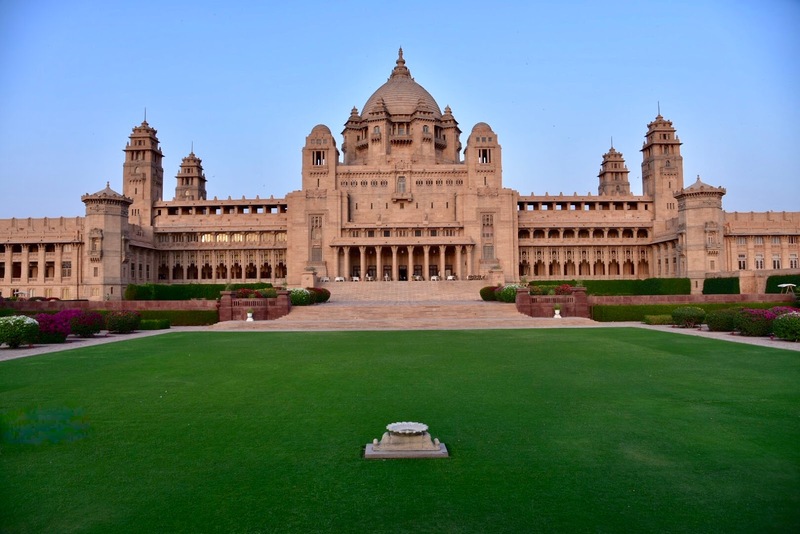 The Umaid Bhawan Palace is perched on a hill, the highest point in town, spreading over 10 hectares (26 acres). 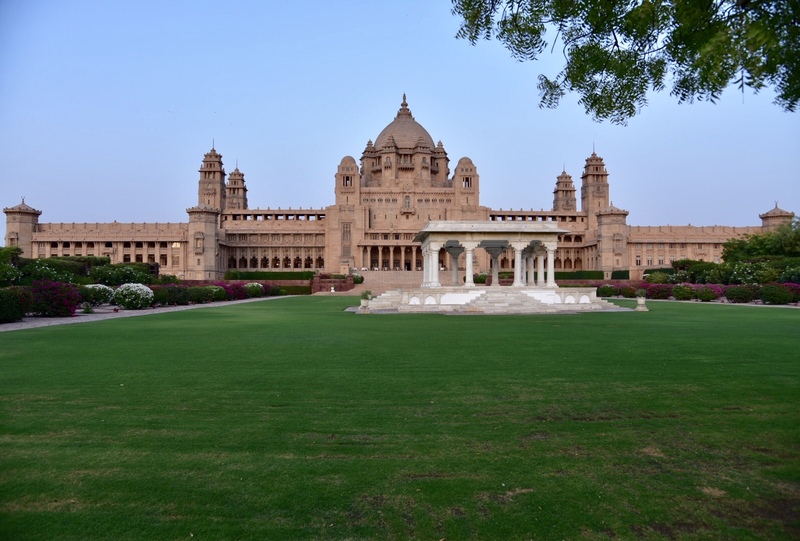 It was constructed by the Jodhpur royal family in order to provide employment for the famine-stricken local farmers. The palace, built in the so-called Beaux Arts style, is one of the world’s largest private residences. 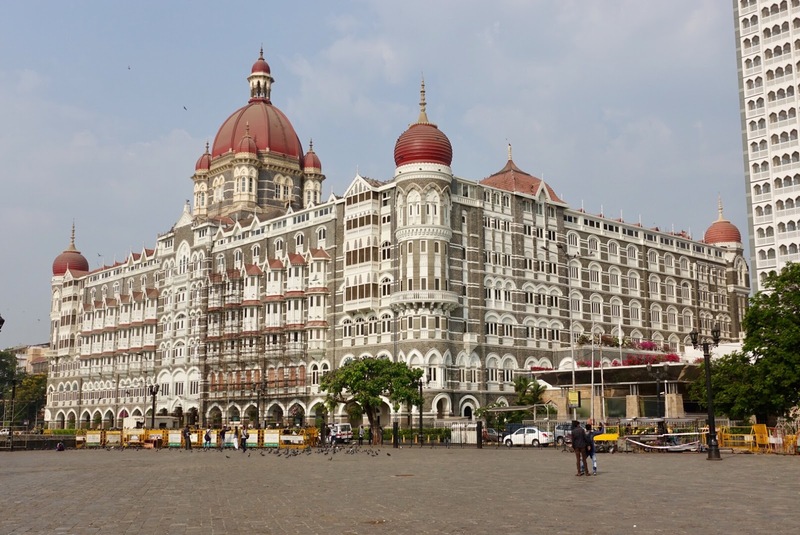 Nowadays, it is divided into three parts, the mentioned museum, the hotel managed by the Taj group and the residence of the royal family. that used to be the banquet hall or outside with views of the lawn.There are two menus to choose from, an international one and an Indian one. I had my share of awesome hotel stays, but never before in such an out of this world setting! 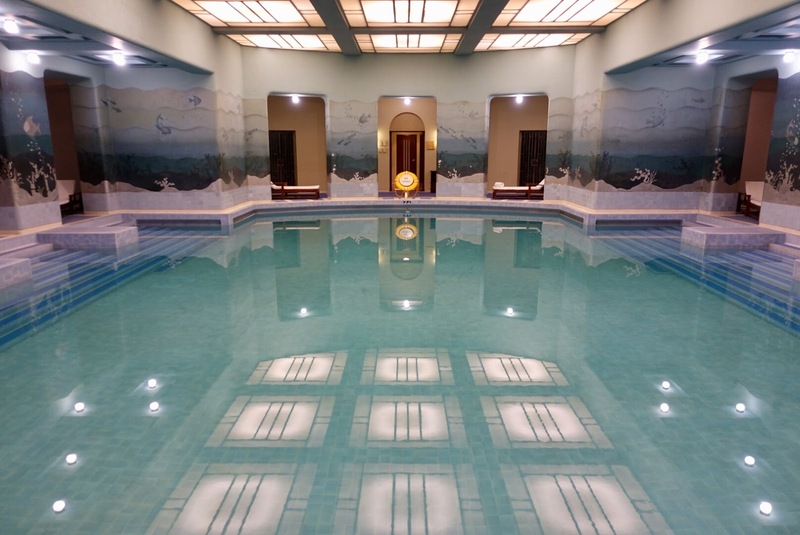 It was so good to linger in the hotel’s public halls, especially in the area of the spectacular central dome where the atmosphere was always so serene, to stroll through the beautifully landscaped gardens or to go around the subterranean zodiac pool. I was just awestruck by so much beauty around me! 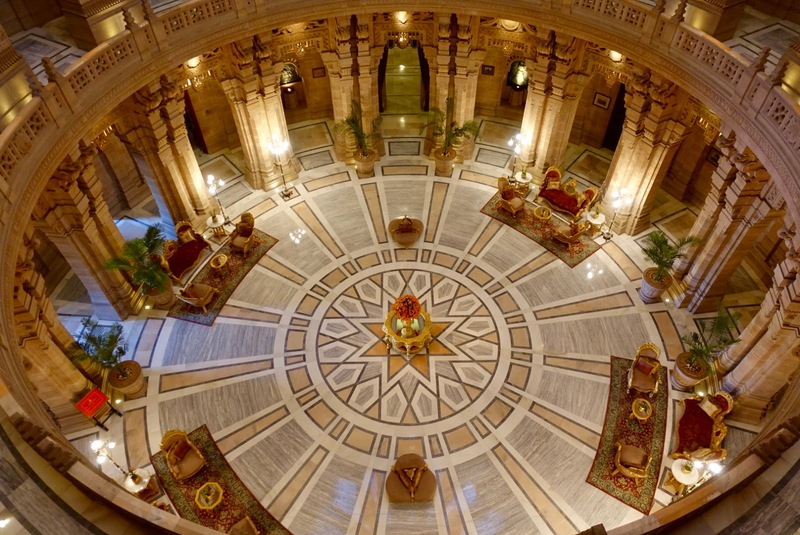 Rajasthan is the land of the kings who built magnificent palaces and forts, many of which are now glorious hotels. Out of our five hotels only two of them had such origins but you could clearly see that with the other ones the utmost had been done to bring in local color in their construction. Apart from this, the standard of the Rajasthan’s high-end hotel industry is impressive, they know how to cater to the needs of demanding guests! 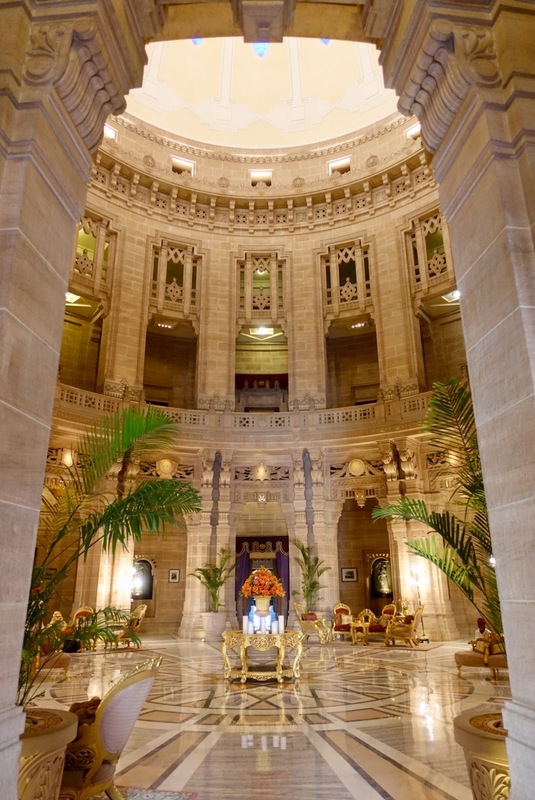 The subject of my next blogpost will be about other outstanding luxury hotels in India, this time in Delhi and in Mumbai. Of course, I will also give tips where to dine as a fine food lover and what to do on a short stay in these mega metropolises.